Two weekends ago we found this amazing pair of mid century lounge chairs by Ib Kofod Larsen for Selig. The bones were amazing but the fabric was worn and the foam was dehydrated. We got started on them right away and chose a fabric in a similar color to the original upholstery. The final result was just as we had hoped and they are as comfortable as they are beautiful! 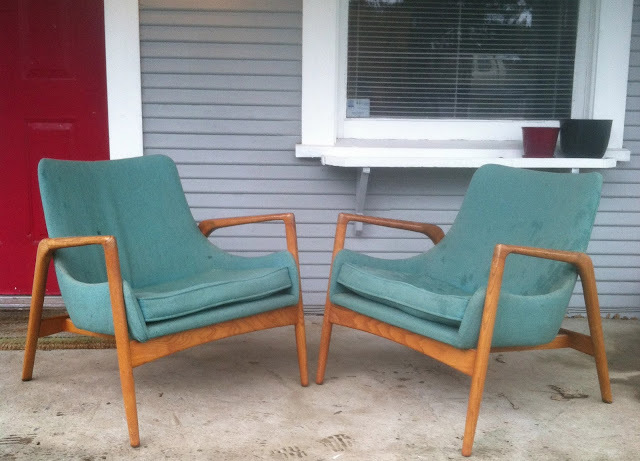 They were placed in Hawthorne Vintage and sold a few days later. They are a thing of beauty for sure! Nice job! Thanks, they were sold yesterday! Those are great! Are they marked? Remind me of Kofod Larsen. I really like your choice of fabric! Do you remember the make/line and color? Thanks!